Asian TYA Network aims to understand the current situation of TYA (Theatre for Young Audiences) in East and Southeast Asia, also to connect TYA professionals of the region for promoting TYA within Asia and to develop long-term relationships and co-operation across countries. Asian TYA Network started in 2016, it is hosted by ACO Okinawa (host of ricca ricca*festa) and co-hosted by the Japan Foundation Asia Center (In 2018, the programme received the support from the Japan Foundation Asia Center). Recently, the interest and recognition of TYA (Theatre for Young Audiences) has been growing in many regions across Asia, with arts organisations starting more activities for children and young people, and several new TYA festivals launching. Especially in regions where economies have been developing rapidly, the role of TYA in communities is anticipated for children to nurture sensibilities and creativity, even in a tough society, and this kind of movement can be seen already. However, the idea of TYA is not established within many communities, and so cooperation and support between artists and professionals is needed in order to spread high quality TYA activities with broader perspectives. On the other hand, in regions where TYA is widely recognised and people have opportunities to see various TYA works from all over the world at festivals, the theme of ‘TYA of Asia’ is often discussed and more people are interested in collaboration and creative exchange with other Asian regions. In 2016, ricca ricca*festa launched Asian TYA Network Programme (co-hosted in 2016/2017 and supported in 2018 by the Japan Foundation Asia Center) and has worked to further connect TYA professionals from Asia, especially South East Asian regions. Every year the programme invites TYA professionals from Southeast Asia to discuss the current situation and issues of TYA in the regions, and to network with other festival participants. The programme has also organised several research visits to Singapore, Kuala Lumpur, Cambodia and Myanmar to meet more professionals and think about TYA in Asia. The activities of the network are now spreading around Southeast Asia. Asian TYA Network Programme aims to deliver high quality contemporary performing arts and continues to work on the development of TYA in Asia by establishing long-term partnerships across countries and regions through networking and discussion with Asian TYA professionals. ricca ricca*festa, the International Theater Festival Okinawa for Young Audiences, is an annual performing arts festival for children and young people in Okinawa, hosted by ACO Okinawa. It started in 1994, and between 2005 and 2013, took place in Okinawa City with the nickname ‘Kijimuna Festa’, building an international reputation with a high quality, carefully selected programme. It was also chosen to host the very first Artistic Gathering of ASSITEJ (International Association of Theatre for Children and Young People) in 2012, of which made the festival’s presence within the international TYA field even more significant. In 2014, the festival moved to Naha City, the capital of Okinawa Prefecture, and in 2015 launched with a new nickname – ricca ricca*festa, ‘ricca ricca’ is a phrase meaning ‘Let’s go’ in the Okinawan dialect. Every year ricca ricca*festa invites productions from Japan, Asia and around the world which can be enjoyed from 0 year to adults. The festival is keen on international co-productions as well and has produced almost twenty so far. Various symposiums, seminars and workshops are also organized for the event. Overall the festival works to bring together a range of presenters and programmers, and has become an important networking hub for TYA in Asia and internationally. Geographically and historically, Okinawa is closely related to other Asian countries, and many strong connections can be found within the fields of arts and culture as well. 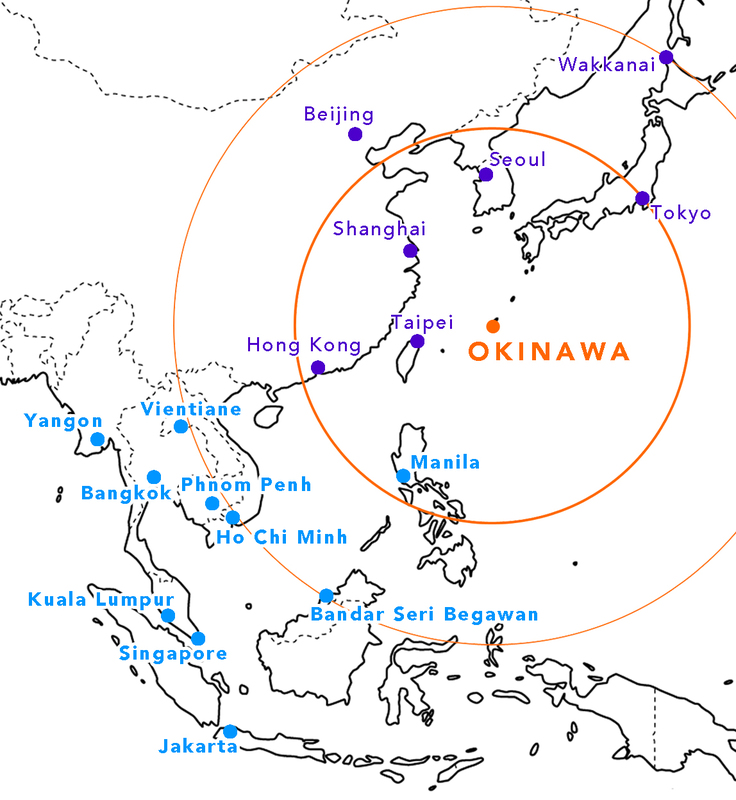 For example geographically, if a circle is drawn with the radius being the distance between Okinawa and Tokyo, most major cities in East Asia are located inside this circle. And if the radius is extended to Wakkanai, the northern end of Japan, the circle reaches a range of countries across Southeast Asia. It is therfore considered that Okinawa is an ideal central hub to establish a TYA network for the East and Southeast Asia regions.